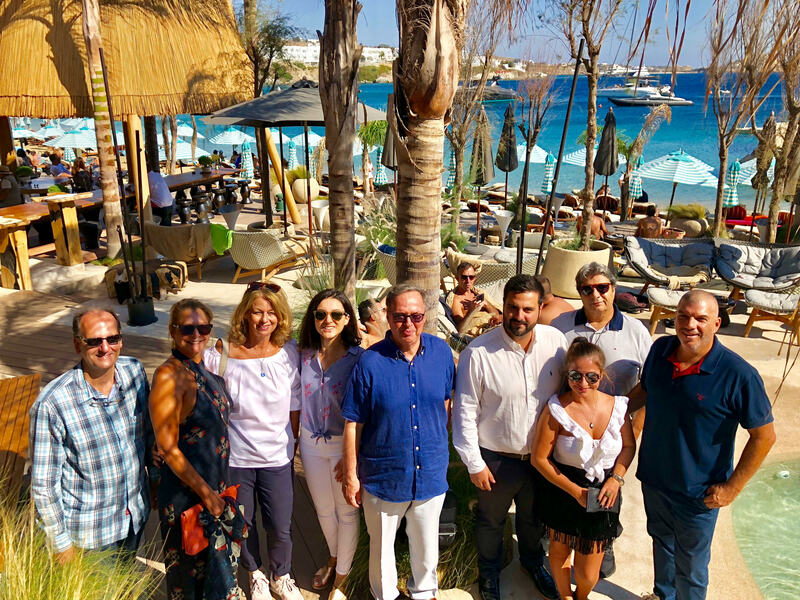 New perspective of collaboration in the fields of tourism and culture between Brazil and South Aegean Region is opening after the recent visit of the Ambassador of the Federative Republic of Brazil in Greece Mr. Cesario Melantonio Neto, to Mykonos and Delos islands. In the Photo: From Left to Right Honorary Consul of Brazil in Cyclades Mr. N.Papoudos, the Ambassador of Brazil in Greece mr. Neto, Vice-Governor of South Aegean Region Mr St. Brigos and the Ambassador of Hellenic – American Chamber of Commerce in New York Mr C. Skagias. Ambassador of Brazil accepted the invitation of Vice-Governor of South Aegean Prefecture Mr. Stelios Brigos to visit the two islands and discuss the framework of the collaboration between the two regions. The Brazilian Ambassador and Vice – Governor of South Aegean Prefecture, during their meeting discussed about developing and strengthening friendly relationships between Greece and Brazil, the possibility of twinning South Aegean Prefecture with Brazilian Prefecture of Santa Katarina as well as the twinning of Mykonos island and Florianopolis, the capital of Santa Katarina, which was established by citizens of Kastelorizo. Ambassador of the Hellenic-American Chamber of Commerce in New York Mr. Kostas Skagias and Honorary Consul of Brazil in Cyclades Mr. Nikos Papoudos were also present to the meeting. Vice-Governor prioritized the possibility of twinning as the two regions share common characteristics. Santa Katarina is a significant tourism attraction in Brazil for VIP and celebrities from all over the world. The Vice-Governor, also, stated to Tourism Press that further development and strengthening of the relationships between South Aegean Region and Brazil will open up new perspectives. 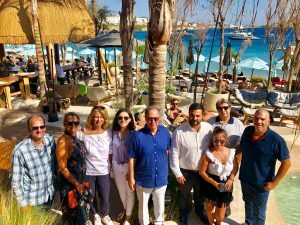 As far as tourism is concerned, Mr Brigos said that the current year far more Brazilian tourists arrived in Mykonos and Santorini islands than last year. Specifically, more than 100,000 visited Mykonos and Santorini islands while last year the number of visitors from Brazil didn’t exceed 68,000. Prior to Brazilian Ambassador’s visit to Mykonos and Santorini islands many other actions have been initiated by South Aegean Region aiming to penetrate the most significant and dynamic market of Latin America. The Vice-Governor had visited a month and a half ago local government of Santa Katarina where suggested the twinning of the two regions. He also accepted the invitation to participate to the celebration of National Brazilian Day, 5th of September in Brazilian Embassy in Athens while the Embassy participated in gastronomy festival of Tselemente in Sifnos island.